Establishing a pleasant environment is the beginning of our relationship together. Honesty and respect need to be come from both sides. Only then will anyone be able to ask and answer questions to develop strategies to get to where you really want to go, not just where you think we need to be. Together we identify and evaluate past financial decisions and how they relate to what you want to accomplish. This will take some investigative work on your part as you gather current information about your finances and think about what you want to accomplish. We will identify strategies and options that may improve on those past decisions. It is not our job to just propose solutions but to describe options and how they relate to you so you can make fully informed decisions to accomplish your objectives and your dreams. Finally, we explain and develop a master plan that outlines a series of options to take you in the direction you wish. The design of this plan should have as much flexibility and efficiency as possible because living and enjoying life not as easy as just going from Point A to point B. 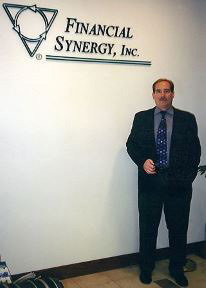 Financial Synergy was formed in 1992 to fulfill a dream of being in control of one’s own work environment. That dream was furthered in 2007 when most meetings became web-based, thus enabling us to move to a home based office. That established another level of flexibility and control. Financial Synergy works with individuals, their small businesses, and as an outside consultant for similarly licensed advisors and their clients. Wherever your location, via webinar technology, we offer a team approach with backup in all things Financial and Tax related. The company is a Registered Investment Advisor, licensed Tax Preparer, and an Enrolled Agent with the IRS. We spend at least 200 hours a year on Continuing Education studies in these areas. That preparation to detail enables Financial Synergy to be ready to answer your Tax, Financial, and Strategic Planning questions whenever you contact us. Dave Marrone earned a Bachelors in Education and a Masters in Accounting from the University of Illinois. He has prepared tax returns professionally since 1972. He was insurance licensed in 1984, security licensed with Financial Synergy, Inc in 1985, and became an independent RIA Advisor in 2008. He became a registered Tax Return Preparer with the IRS in 2012. Dave’s well-rounded variety of experiences helps him work to coordinate the various corners of the financial services arena.